God’s amazing design in nature can be seen in millions of living things—big and small—all around the world. One remarkably complex, well-designed organ is the tongue. There is a great variety of tongues among animals. Some have big tongues; others have skinny tongues. Some have fast tongues; others have ultra-sensitive tongues. But regardless of the size and shape of various animals’ tongues, their abilities are something to be considered…as is their Maker! The chameleon (kuh-ME-lee-un) is probably most famous for being able to change colors and move its big eyes in different directions at the same time. 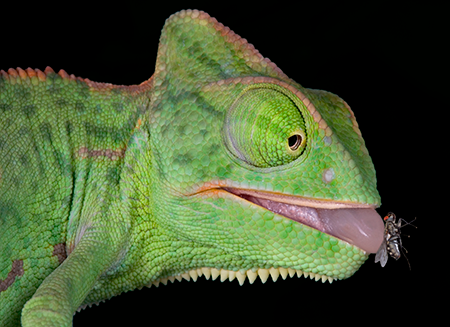 But did you know that the chameleon also has one of the fastest tongues on the planet? It is so fast, in fact, that it is difficult for the human eye to see it when the lizard shoots it at potential prey (which may be more than a body length away). Just how fast is this super-hero-like tongue? 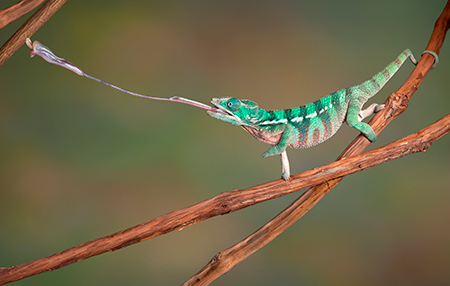 Scientists have discovered that the chameleon’s tongue can accelerate five times faster than a fighter jet. Now that is fast! The biggest tongue on the planet should come as no surprise: it’s owned by the biggest animal on the planet. 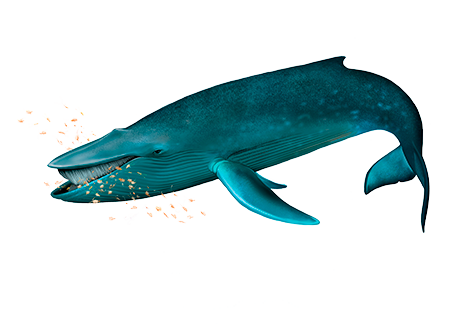 The blue whale has a tongue so large that 50 people can stand on it at one time. What’s more, it can weigh about three tons...or about as much as a medium-sized Asian elephant! It may be that, like many kids around the world, you enjoy squirting water out of your mouth. Maybe you squirt it through your teeth. Perhaps you just squirt it out through your tightly rounded lips. However you do it, your tongue is definitely involved. Amazingly, a fish called the archerfish actually forms a tube with its tongue and shoots water out of its mouth at potential prey (such as insects and spiders). However, unlike most of us (who don’t have very good “squirting” aim), archerfish are able to hit their intended targets with pinpoint accuracy time and again. These fish are superb “spitters” because they were designed by a great Designer Who gave them remarkable tongues. 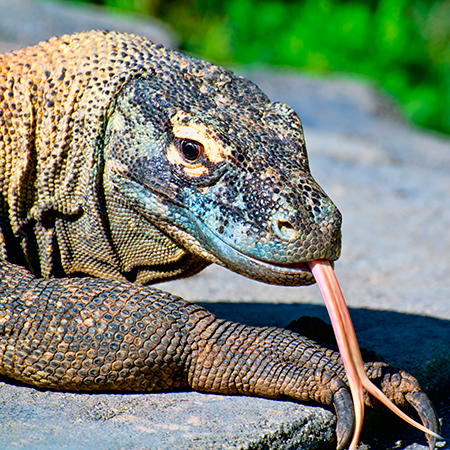 God designed the Komodo dragon’s eerie, waggling, forked tongue with the ability to capture scent molecules in the air. How far away can they smell things? 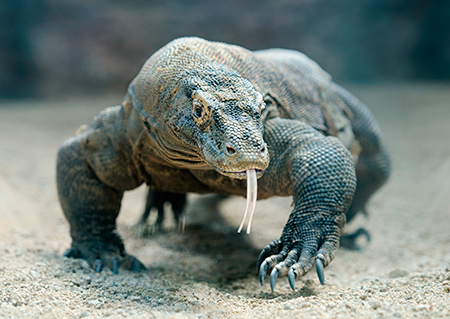 Astonishingly, komodos can smell the flesh of a wounded or dead animal 2½ miles away! The mallee fowl has a tongue that it uses like a thermometer. How so? After the hen lays eggs inside the bird’s large nest (called a mound), the male keeps a close watch over them. 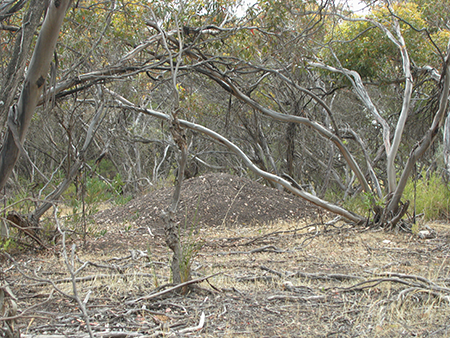 The male mallee ensures that the mound and eggs stay right at 92°F. How does it do this? The bird simply sticks its beak and tongue into the mound. With its tongue, this amazing little bird can tell if the temperature is too high or too low. The mallee might scrape some of the mound away to cool the eggs, or it might build up the mound even more in order to raise the temperature. These birds appear to be able to use their tongues to tell the difference in only 1/10 of a degree. Talk about complex design! Thermometers were developed and designed by highly intelligent men over several centuries. 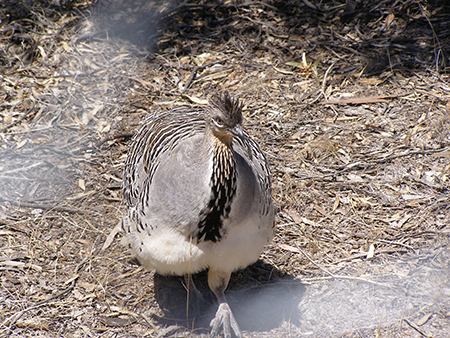 Obviously the amazing mallee fowl “thermometer” is no accident of evolution. Such design demands a Designer! 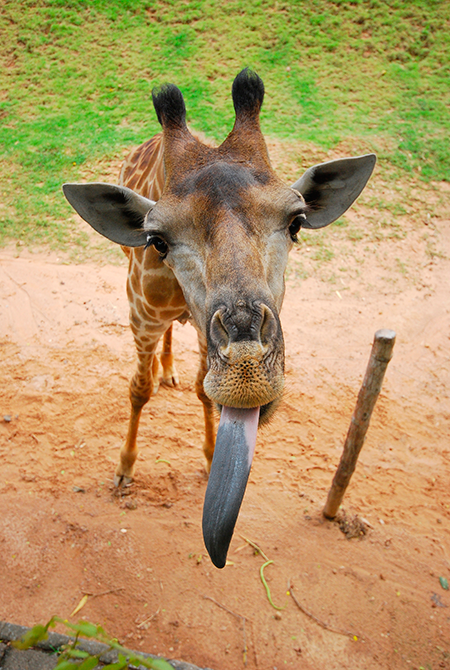 A giraffe uses its 18-inch tongue to grasp twigs and strip them of leaves. The tongues of giraffes are also incredibly nimble, able to “lick up” leaves from in-between the thorns of acacia trees.